‘Tis the season — for goal planning, that is! 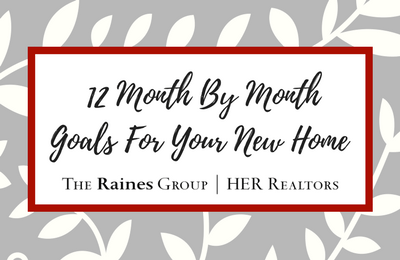 Many people spend December reflecting on the year and creating a list of goals to aim for in the New Year, and recent home buyers are no exception. If you’re thinking about ways to preserve that “new-to-you” feeling in your home and keep the clutter at bay throughout the year, follow our handy month-by-month home organization planner. Decluttered spaces can keep your home looking and feeling like new (even if it isn’t). While you’re putting away holiday decorations, take some time to tackle any clutter that has begun to accumulate in catch-all spaces, such as closets, the garage, and any rooms that are still full of half-unpacked moving boxes. Detailed planning is a great way to stay on top of your New Year’s home organization goals. Outline a list of tasks to complete daily, weekly, and monthly. This list can include indoor and outdoor maintenance as well as fun tasks like decorating. Be sure to pin your home organization plan in a conspicuous space, such as on the refrigerator. You can also lighten your workload by divvying up the tasks to other members of the household. Kick off the spring season with a thorough cleaning of your home. In all likelihood, your new home won’t need too much TLC, so just focus on the well-used areas of your house: the kitchen, bathrooms, bedrooms, and main entertaining spaces. Take a break this month. You’ve earned it. Instead of cleaning or decluttering, decorate your home with greenery to usher in springtime. Flowers, succulents, and low-maintenance plants look great indoors. The kitchen is one of the most used spaces in a home. Devote the full month to tackling any clutter issues in the drawers and cabinets, investing in space-saving organizers, deep cleaning the stove, and repairing appliances if necessary. Follow the same plan as you did with the kitchen, but this time focus your cleaning and decluttering efforts on the bathrooms. Dispose of any expired prescriptions or toiletries and consider flushing out your pipes. After a few months of living in your home, you may start to notice little spaces that collect a lot of clutter. The so-called junk drawer is often a major aggravation to homeowners. Take some time to try and find a new home for the items that have accumulated in this drawer or space. You can also come up with clever ways to keep the clutter at bay, or at the very least look intentional. Drawer dividers, wooden trays, and small containers can transform any cluttered drawer into a well-organized space. It’s easy to let papers pile up on the counter or on the desk. First, discard any junk mail that is contributing to the clutter, then sort through the rest of the papers in the pile. If you don’t have a system in place yet, create a way to effectively manage your mail and other documents, such as a binder or a filing cabinet. Be sure to go through your old documents from time to time and shred what you need to. Now that summer is coming to a close, sort through your wardrobe and figure out what you didn’t wear this season. Consider donating gently used clothes and accessories to a local charity or selling them at a yard sale. Think back to the whole-home organization plan you created in February: Have you been able to keep those resolutions? Are you noticing that you need to complete certain tasks more often than others? Reevaluate your plan and make changes as you see fit. If you’ve had trouble sticking with your organization plan, take this time before the holidays to pick up where you left off. As the holiday season approaches and the year winds down, go through your collection of holiday ornaments and other decorations. Keep the ones you use most often and discard any that you have either not used or cannot repair. If you plan to entertain guests for the holidays, focus your cleaning and decluttering efforts once again on the kitchen. This time, instead of devoting all of your time to the drawers and cabinets, turn your attention to the fridge. Dispose of any expired food, transfer leftovers to smaller containers, and rearrange your shelves to make more room for holiday dinners. Whether you’re thinking about buying a home in 2018 or have just moved in (congratulations! ), we’re here to help you with everything you need. Call us and we’ll provide you with even more homeowner tips and resources.